Can Apple's best-ever smartphone stay on top in 2018? The iPhone XS Max is the most powerful, the largest, and the most expensive phone Apple has put it – so how does it compare with the super-sized Huawei Mate 20 Pro we're expecting to be unveiled on 16 October? If that's your question, we've got the answers. Bear in mind that we know exactly what the iPhone XS Max brings with it in terms of design and specs, whereas we're still speculating about the Huawei Mate 20 Pro – though we do have some fairly solid rumours to go off. We'll update this article once we know specifics. The iPhone XS Max hasn't deviated too much from the iPhone X design we saw given its debut in 2017 – it's just got a lot bigger (a 6.5-inch screen rather than 5.8-inch screen). The display notch is still there, the bezels are still ultra-thin, and there's still a dual-lens rear camera around the back. Last year the iPhone X helped define the future look of smartphones across the industry, and while the iPhone XS Max largely sticks to the same formula, there's no real need for it to change: it's a fantastic-looking phone, and that huge OLED screen certainly helps. So what we can expect from the Huawei Mate 20 Pro? We're still going off leaked renders at this point – even though there have been quite a few of them – so we can't say anything for sure except it's definitely going to be big. The most recent rumours suggest the screen size will be in the region of 6.9-inches, which is practically tablet territory. The Mate 20 Pro is also said to be carrying a triple-lens rear camera in quite an unusual rectangular layout (together with the flash). The display notch is apparently going to stay, and be a little larger than it will be on the Huawei Mate 20 – the smaller Mate 20 is being tipped to have a compact, teardrop-style notch. Apple spent plenty of time enthusing about the A12 Bionic processor it's packed into this year's iPhones, with the biggest speed improvements promised in AI-related tasks (like recognising faces). It's undoubtedly the fastest processor Apple has put inside an iPhone, and with the iPhone XS Max its paired with 4GB of RAM. You can pick up the iPhone XS Max with 64GB, 256GB or 512GB of internal storage, while the dual-lens 12MP+12MP rear camera has received some minor upgrades. Around the front there's a single-lens 7MP camera for those all-important selfies. The Huawei Mate 20 Pro, meanwhile, will come packing Huawei's own Kirin 980 processor – a chipset Huawei executives are confident will outpace anything Apple has to offer (but then they would say that). Whatever the benchmarks prove in the end, you can be sure that the Mate 20 Pro will instantly be one of the most powerful Android phones on the market as soon as it arrives. The rest is rumour and speculation, but the Huawei Mate 20 Pro is said to include a huge 4,200mAh battery, which is way beyond the 3,174mAh one inside the iPhone XS Max. Bear in mind that the Huawei phone may well have a bigger screen to power though, so battery life may end up being evened out. So what else do we know about the iPhone XS Max and think we know about the Huawei Mate 20 Pro? We know that the Apple phone comes running the latest and greatest iOS 12 software, whereas Huawei's handset is likely to have Android 8.1 Oreo on it (with the Huawei EMUI skin). That's one way of choosing between these phones. Perhaps the most intriguing rumour we have about the Huawei Mate 20 Pro is that it'll be Huawei's first phone to have an in-display fingerprint sensor on the front. That means no need to have a sensor on the back, and means you don't need to be looking at your phone to unlock it – as you do with the iPhone XS Max and Face ID. Apple introduced wireless charging to the iPhone range last year, and it's present and correct on the iPhone XS Max of course. As for Huawei, we think the Mate 20 Pro will come with wireless charging, based on leaks from the supply chain, but it's not a technology that Huawei has been particularly fond of in the past. Finally, the rumour is that Huawei is preparing its own version of Apple's AirPods, potentially called the Freebuds 2 Pro – they might well show up with the Huawei Mate 20, and based on some of the leaked images we've seen, it's possible that the phone itself might serve as a wireless charger for the phones. We don't know the exact details of the Huawei Mate 20 Pro until they're confirmed, of course, but we can already make a good bet about what it's going to bring with it. With a huge screen and triple-lens camera, Huawei is really going to be pushing the boundaries of its smartphone tech. Apple has played it more conservative with the new iPhones this year, though the iPhone XS Max does boast an improved camera, the biggest screen ever seen on an Apple handset, and that super-fast Apple A12 Bionic processor. The iPhone XS Max is still a very, very attractive phone, even if there haven't been many changes from last year. As for pricing, we know the iPhone XS Max starts at £1,099/$1,099 and goes up from there, and we're expecting the Huawei Mate 20 Pro to start at £799 at least (that's $1,045 with a straight currency conversion). The Huawei phone is likely to be slightly cheaper than its Apple rival, though perhaps not by much. 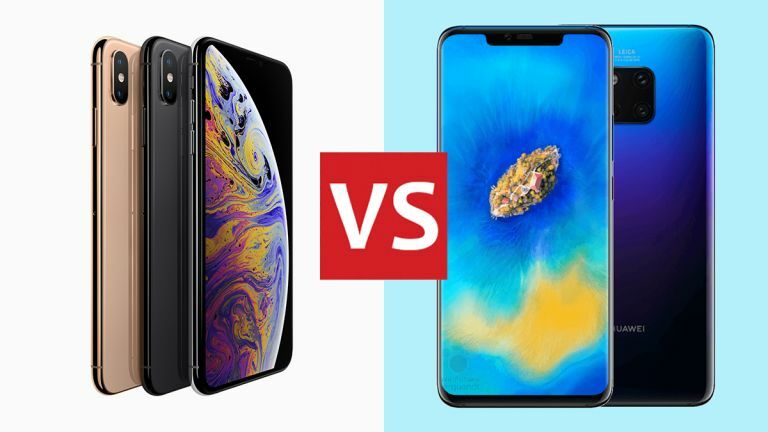 Your preference for Android or iOS will of course inform your decision too and may well already have convinced you to get either the Huawei Mate 20 Pro or the iPhone XS Max. These 2018 handsets are the best and biggest phones Apple and Huawei have ever produced – so it depends which company's work you like the look of best.